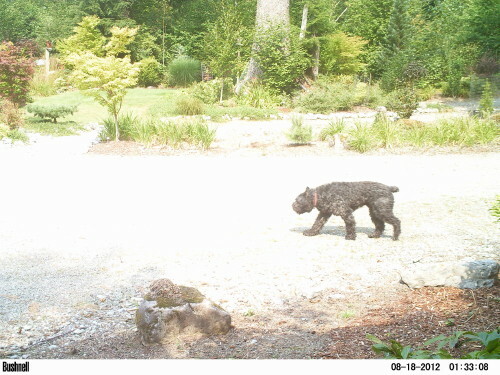 The trail camera failed several months ago. A cautionary tale: I won’t go into all the details, but these can also be a security camera. Unfortunately, the camera had failed, so it wasn’t working the morning that we had an un-welcome man looking in the bedroom window and ringing the doorbell. I had never seen him before and didn’t answer the door. Later it turned out that it was most likely the same man who broke into a nearby house, beat up and robbed a woman, then fled. He came back later that night, fought with the homeowners and was killed by one of the homeowners with a kitchen knife. He had items with him that indicated that he had very bad intent. If my camera had been working I would have had a good photo of him for the police, and we might have been able to identify him before this happened. I will always make sure that we have at least one working camera at all times. We bought another Bushnell trophy cam. It’s working perfectly. Pay attention to your instincts. If something doesn’t feel right, listen. If I had ignored my instincts that day, things might have been very different. On a lighter note: here is the most pesky critter that has visited in the last week or so. 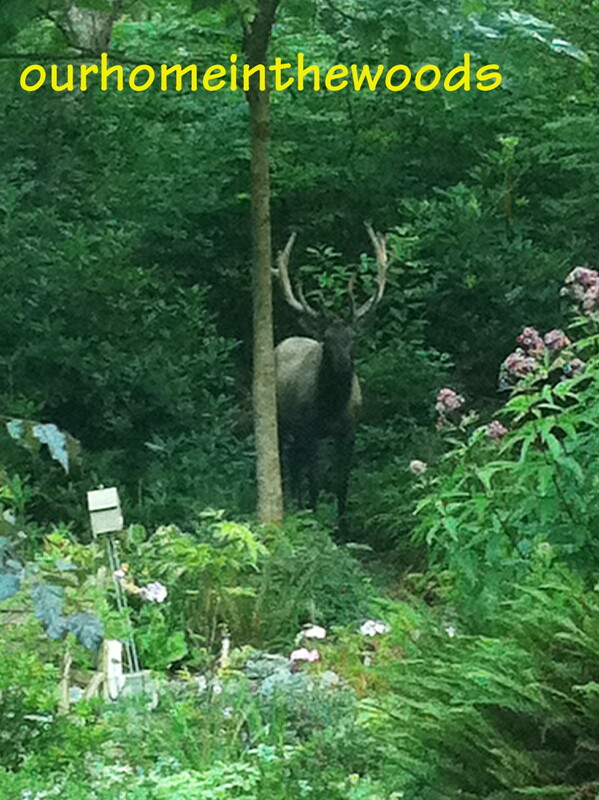 This elk has eaten literally hundreds of daylily blooms, over a dozen large hostas, lots of hydrangea blooms and even a gunnera, Yes I said a gunnera! 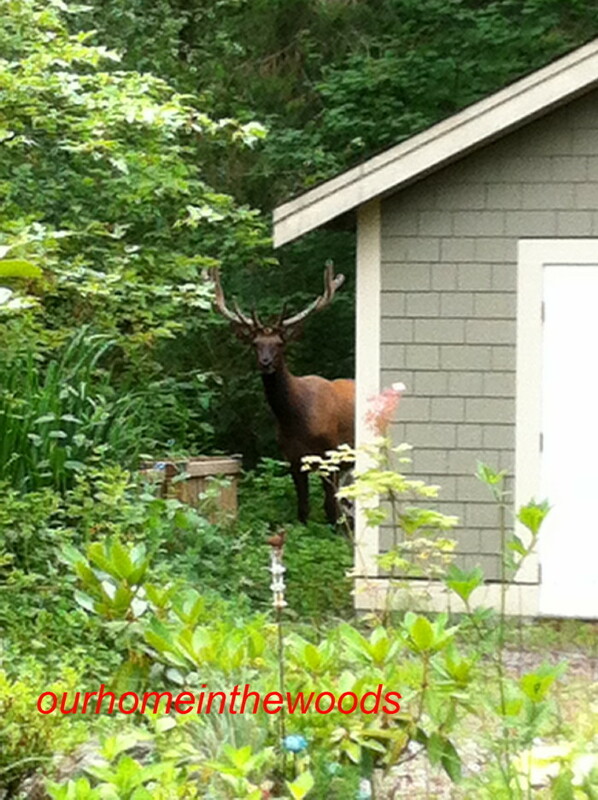 Nothing eats those, this elk is crazy! 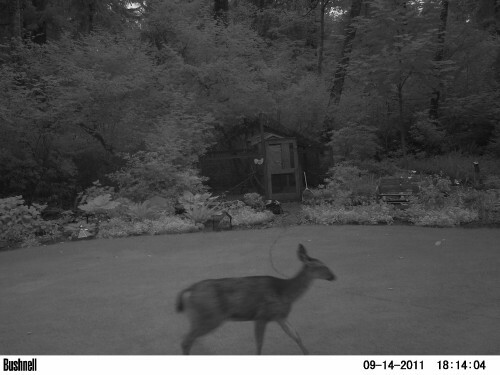 He has been coming round the clock and often with a doe. He stands a couple of feet taller than our pick up truck. I have a netting over some of the hydrangeas now. 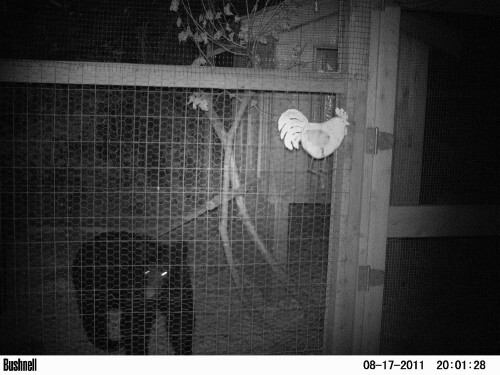 Here’s a link to the original post: http://wp.me/p2kNeQ-fQ There are lots of wildlife candid camera photos. 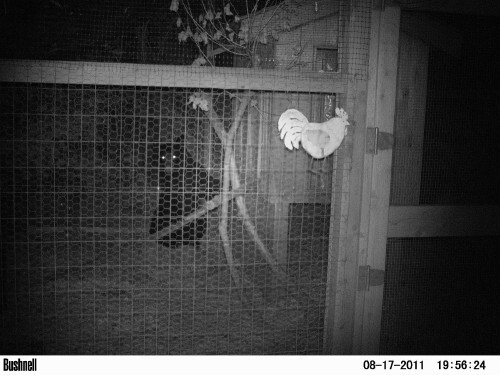 this bobcat tore the top netting off and ate 11 chickens! neighbors dog came over to leave ‘deposits’ in our yard 😦 bad dog! When you live in the woods, you’re never really alone. You may not see ‘anyone’ when you look around, But even if you don’t see them, ‘they’ are there. You often sence their presence. ‘they’ could be in the trees, in the woods or in the ground. You may catch some movement out of the corner of your eye, or hear a sound, maybe just a hint of movement. You may not see or hear anything but the hair on the back of your neck stands up. 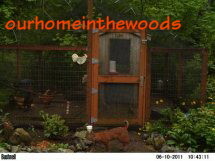 We have learned a lot about who visits our yard by installing a wildlife trail camera. Though these aren’t commonly used by gardeners, these are a common tool of hunters. We bought ours at Cabellas for under $200. It stores info on an SD card that you buy. 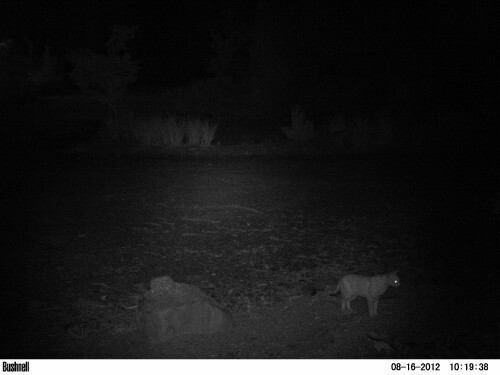 We have seen deer, elk, coyotes, bobcats, bears, the neighbors dog and most recently a cougar. 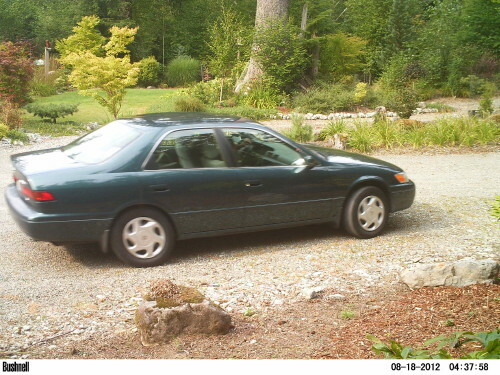 It also captured a strange car that came down to the house one day. There are a variety of features. 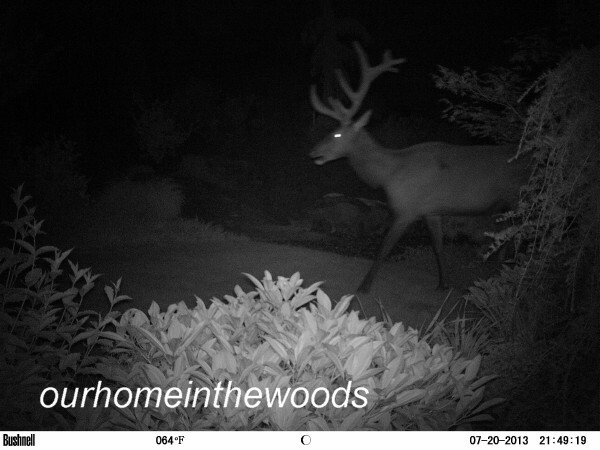 An Internet search for trail cams will bring up lots of options. Ours is a Bushnell. It’s worked very well for 2 1/2 years so far. We’re going to buy another and use both, one in the front and one in back yard. Ours will take stills or video. It is motion activated. It takes color by day and the infra-red takes black & white photos by night. I change the eight aa batteries about once a year whether they need it or not. strange car that came down our driveway??????? It’s a great way to find out what might be in your yard. Maybe one day some I’ll be posting a photo of big foot, or maybe not. 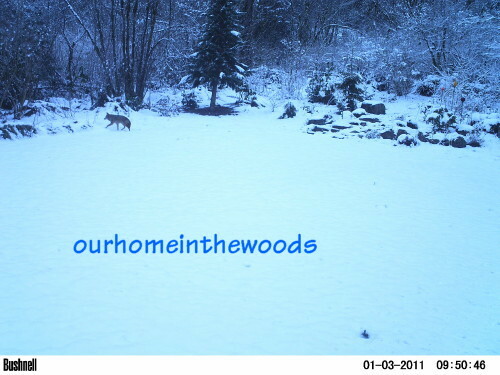 In the mean time, enjoy some of the photos the camera has captured in our yard. It is interesting for security also, although after the fact. You know it doesn’t matter how many times we see them in the yard. I’m always mesmerized when I see them. They are huge, majestic and awesome, then reality slowly sets in. When I realize that they have eaten all but two leaves of a beautiful hosta, the awesomeness of the elk turns to awfullness! As soon as I take a few photos, one of us is outside chasing it out of the yard. 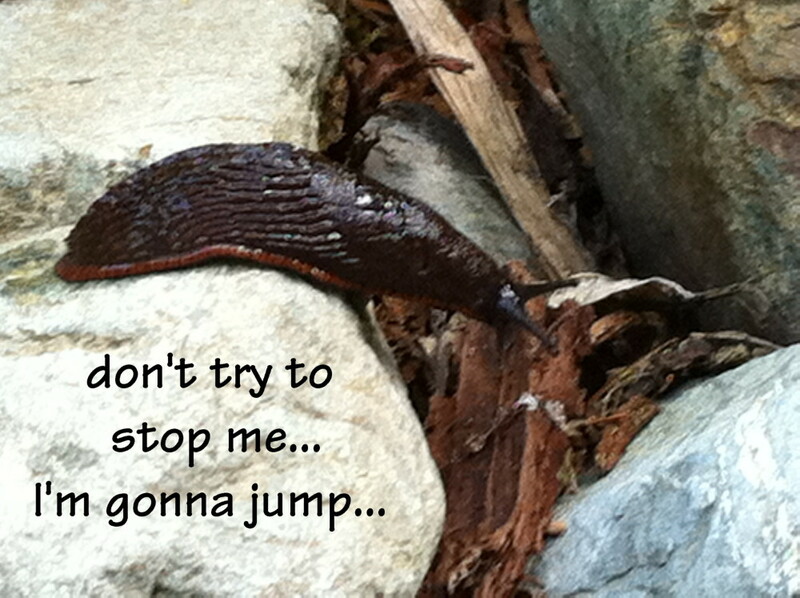 More often than not they will end up heading toward the neighbors property. Elk are big animals and do a lot of damage. I collect hostas, we have several hundred and even with that many, I will notice any that are damaged. 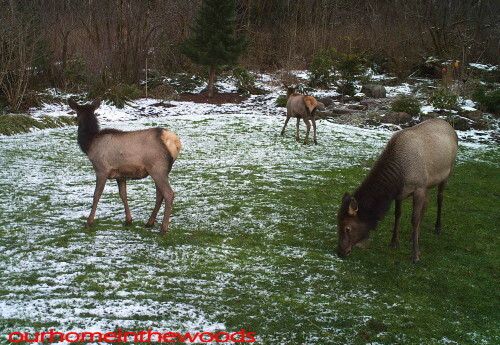 They eat the hostas as well as many other plants, while walking across the lawn the create big divets in the sod, and adding insult to injury… they leave rather large elk droppings. 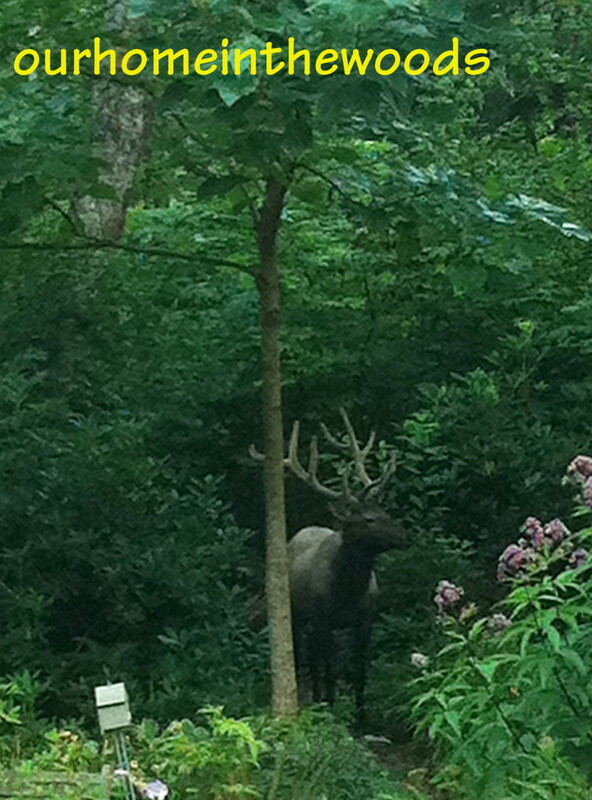 These photos were taken through the double glass of the kitchen window and from about 50 feet away, with a i-phone. bunnies in the garden mean trouble for plants! These are some of the signs of spring in the maritime climate of the Pacific Northwest.